Why Get Trained in Microblading? Becoming trained in Microblading allows you to add to your arsenal of beauty skills and give your clients what they are begging you for: Natural, Beautiful, Brows. The Microblading Essentials Course is offered via an innovative, virtual platform that can be viewed from any computer, tablet or smart phone. 12 months access is provided to the course upon purchase. One-on-one support and mentoring is available in conjunction with Microblading Essentials via Voxer app for an additional fee. Optional live model work with instructor is offered via the Microblading Edge course after completion of Essentials. The Sassy Wink Academy Microblading Essentials course is $1997. I definitely want to practice on a live model, why isn't this offered as a standard part of the course? It is the philosophy of the Sassy Wink Academy founder that most students are not ready to begin working on live skin alone after a 3 to 5-day course. Weeks and months of practice on paper and synthetic skins is mandatory in order to develop the understanding, muscle memory and new skills for the microblading technique to begin to be performed independently on live models. There should be no rushing into working on live faces until the student can consistently design two matching brows, duplicate proper hair stroke patterns (mirrored on both brows) and with consistent depth on the mannequin and artificial skin. Sassy Wink Academy offers ongoing mentorship and future live model practice opportunities for those who qualify. What comes with the Microblading Essentials course? With your Microblading Essentials Course you receive a PDF downloadable student workbook, Student Practice kit (to complete all required practice sessions) and certificate of completion. How will I know where to buy more product? Sassy Wink Academy has partnered with 3D Beauty to fulfill all of your needs for the microblading service. Your student workbook includes a handout on vendors to purchase more supplies from as you need to replenish and add to your kit. Do I need special licensing or insurance to offer this service? Each state (country and province) regulates permanent cosmetics/tattoo/body art uniquely. It is up to you to check with your state board of cosmetology and/or state department of health and county for current regulations and licensing requirements. You should carry professional permanent make up liability insurance. Your student workbook includes a handout with suggested companies to obtain quotes from. *Additional support available upon request, based on instructor availability and for an additional fee. Will I be certified to do Microblading after this class? 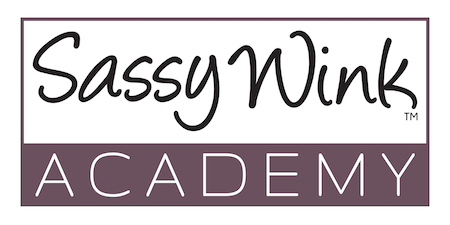 Sassy Wink Academy provides education on Microblading Essentials. Upon leaving the course, students receive a Certificate of Completion, but are not “certified”. There is NO CERTIFYING BODY OR BOARD REGULATING MICROBLADING OR PERMANENT MAKEUP, therefore, technically no one has the authority to “certify”. After students have practiced diligently and can demonstrate consistent Microblading Artistry (both before, after and healed results) via submitted pictures, then they may be recognized as a “Sassy Wink Academy APPROVED Professional Artist” and will be advertised via social media as such. What comes in the student practice kit? I’m not an esthetician, cosmetologist or permanent makeup artist, can I take the Microblading Essentials or Edge course? YES. But bear in mind that while it is possible that one could be very talented as a microblading artist with no beauty or skin background, it is in any beauty professional’s long term best interest to have a foundational license or certification. Everyone will encounter a learning curve while studying the microblading techniques. However, those with no beauty background at all may experience a greater learning curve. How quickly can I expect to begin taking clients after this course? This depends on YOU and how comfortable you are after completion of the Microblading Essentials course. Some students dedicate themselves to hours of daily practice and may begin working on models within weeks, then build up to taking paying clients in as little as 1-2 months. Others slowly work towards this goal and may take 3 months or more before they are actually beginning to take clients. Those who take advantage of mentorship via Voxer and return for live model mentoring (Microblading Edge course) reach their goals faster. Be considerate and kind to yourself to allow the time to build up the necessary skill and confidence before taking paying clients. On average, with focused and daily practice, one might expect to feel a level of confidence in their microblading skill within 3-6 months. Sassy Wink Academy strives for complete student satisfaction, however, due to the nature of our virtual, online courses which provide immediate access to all information, THERE WILL BE NO REFUNDS. For those attending any in-person courses or mentoring with Sassy Wink Academy, we do not offer refunds after attendance. We do not offer refunds for non-refundable deposits to hold a spot as spaces are limited. Support via the Voxer app is available to students for one-on-one mentoring for $49 a week (billed monthly).